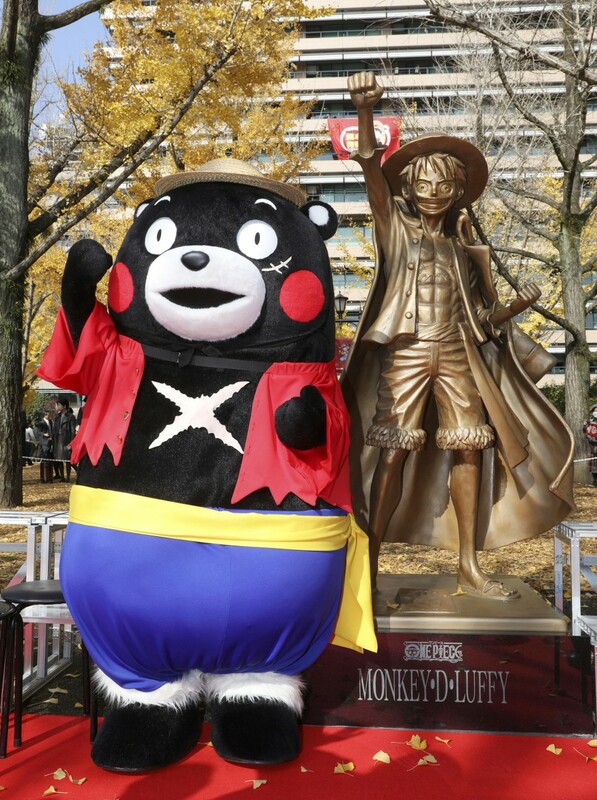 A statue of cartoon character Luffy from megahit comic and animated TV series "One Piece" was unveiled Friday in front of the Kumamoto prefectural government office building in southwestern Japan. The 174-centimeter-tall statue, matching the height of Monkey D. Luffy, the main character of the story, has been erected to commemorate author Eiichiro Oda's reception of a prefectural honor for his support of the region's rebuilding efforts following a major earthquake in 2016. Oda, who hails from the city of Kumamoto, expressed hope in a statement that the Luffy statue will help draw visitors to the prefecture. Following the disaster, he provided illustrations for local railway cars and donated 800 million yen ($7.1 million) to the prefecture under the name of Luffy. "We are thankful for his great contributions. Just like Luffy, we will never give up and move forward to reach our dream despite the adversity caused by the quake," Kumamoto Gov. Ikuo Kabashima said at the unveiling ceremony. "One Piece," depicting the adventures of Luffy, who aspires to become a pirate king, and his companions, is a manga series in the Weekly Shonen Jump magazine. Over 430 million copies of the comic books have been printed in at least 42 countries and regions, according to the prefecture.